Immediately we were greeted by an attractive young French woman who warmly invited us into the restaurant. 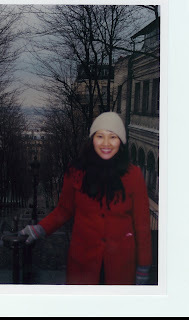 At 8 PM on a snowy Monday night she showed us to a cozy table on a banquet in the middle of the room. I was relieved that on a slower night she didn't try to put us in some weird Siberic outpost when the room had plenty of seats, which is a pet peeve of mine. With its simple white table clothes and bistro chairs, and strains of music I felt like I was in an authentic French bistro. It seems as if clown faces were the official mascot with unnerving clown masks decorated every bare space on the walls an don their website. We were cheerfully greeted by a waitress tidily attired in a crisp white shirt, long white bistro apron, and black vest, which leant an air of chic authority. She immediately notified us that they were out of the rabbit. A bus boy attentively kept us in water and bread all night. The bread was crusty, but not the kind that you ask for second helpings of. The menu is long, especially with the addition of a page of specials, and a $30 three course prixe fix option. Luckily the waitress was able to guide me through my choices. My companion chose the prixe fix selection. The Chopped Endive, Walnut & Beet salad-- had good, clean flavors*, but I instantly lost interest when the Foie Gras with Apricots & Brioche arrived. The portion was sizable, and recalled to mind the New Year's Eve in Paris that through mistranslation I ordered three digits worth of this kind of foie gras. As a result, I couldn't bring myself to eat foie gras for an entire winter. Next came Steak Tartare with Rye. My date and I can never pass up steak tartare when it's on a menu. Our favorite is at Barbaras Lynch's restaurant The Butcher Shop, and comes with brioche at a big price tag and tiny portions. But it's so flavorful that you don't need a huge portion. Steak tartare begs for a libation, and at a more moderate price you can enjoy a glass of bubbly and very good version at Eastern Standard. Pierrot's spicy version tasted earthy paired with the off sour taste of the rye, perfect for a thinking woman. It stood up well to its competition. I'm a freak for condiments, and the House Pate with accompaniments was ample with them. My companion ordered traditional Veal Blanquette upon a third party recommendation. He enjoyed it. I thought my career as an elite food writer was dead in the water when it was revealed that I don't care much for pork loins and veal. Andrew Zimmern on the Travel Channel's Bizarre Foods show with gave me hope when he ate duck fetus in the Philippines. I've enjoyed a few in my time. At any rate, he said he would not think less of his friend for recommending the Veal. My entree, Duck L'Orange, contained a seared duck breast and a confit leg covered with a caramel tasting orange glaze. I ignored the breast, but the confit was rich, crispy & soft and went well with the orange flavor. Since I have been on a souffle kick we wanted a chocolate souffle for dessert, the kind you order at the beginning of your meal. Unfortunately there was a minimum of two orders. I don't like to put all of my eggs in one basket when it comes to dessert, so we chose Lavender Creme Brulee and the Cheese Plate. Our server brought over a dessert tray showcasing their wares attractively. The creme brulee only had a faint trace of lavender, and was chewy where it should be crackling crispy, and soupy where it should be smooth. I regretted the chocolate souffles immediately. The cheese plate, on the other hand, was hand cut and simply assembled onto a plate with nuts and a balsamic glaze. The cheese was divine. Wedged between the little lamp and a cartoonish potted succulent plant was the comment card adorned with a clown. The dining experience compelled me to sign up for their e-mail list and reveal my birthdate. The food and atmosphere at Pierrot Bistrot warranted an invitation to keep in touch. 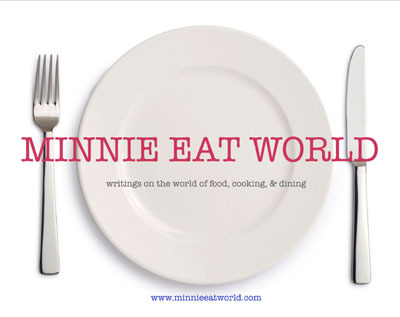 A published food writer, book editor, cooking teacher, and restaurant industry insider, Minnie is always contemplating her next meal and the many unexpected ways that the world of food truly inspires her. Her writing has been published in the Boston Globe, Boston's Weekly Dig, The Somerville News, Where to Eat Magazine and more. Subscribe to this blog. Unlike most things in life, It's FREE.